It never fails. Around October and November, many consulting firms will get calls from clients asking them to design a new roof for immediate replacement, often due to either building problems or new tenant or lease demands. This could be an absolute necessity, depending on the severity of leaks and the interior environment the roof is supposed to protect. Contingent on the size of the roof, its complexity, and contractor availability, there may be time to squeeze in the replacement before the snow falls. Of course, one would hope with regular maintenance and proper capital planning, winter-weather roof replacement could be avoided. However, hope is not always a successful strategy. This is not to say roofing cannot be performed during the colder months. However, there are many challenges posed to winter roofing work that must be addressed by designers, contractors, and owners, which are not present during the warmer construction season. These difficulties can be further amplified when reroofing over an occupied facility, whereas with new construction, the risks to the interior are generally not as critical. When real Canadian winter-weather conditions (such as low temperatures, freezing rain, and wet and heavy snow) begin will vary depending on location. These Torontonian authors recall asking a property manager in Kapuskasing, Ont., “When does it start to snow up here?” He replied snow could start falling as early as October. A quick check of Environment Canada records confirmed the average October snowfall in Kapuskasing is 215 mm (8 ½ in.). 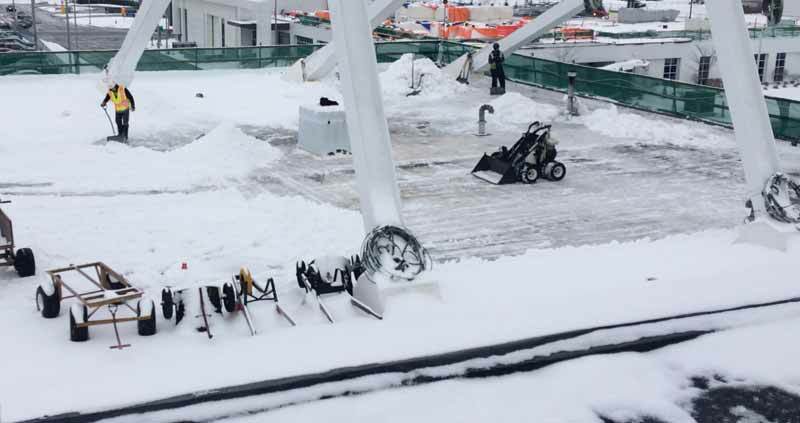 When the final roof review was completed a few months later, it was a balmy –22 C (–7.6 F) at the project site. For the purposes of this article, one should assume ‘winter roofing’ falls between November and late March. Although this timeframe varies across Canada, the general topics presented here are typical considerations that should be addressed in the decision-making process of when to begin/continue roofing and when to stop until the weather improves enough to facilitate good roofing conditions. With this project, use of conventional drying techniques was prohibited, so the contractor had to tarp the roof to minimize the effort involved in drying it. Is this a new build or a replacement of an existing roof assembly on an occupied building? Although many of the items to be discussed are relevant to both new and replacement operations, reroofing over an existing building in the wintertime poses a greater challenge. This is particularly true if the building is a data centre, transformer station, hospital, long-term care facility or seniors’ residence, airport, manufacturing facility, or similar, where any form of water leakage can have significant implications for building users and operators. With new construction, roofing contractors are less concerned with water damage to the interior of the building. Installation of the roof usually starts right after the roof deck has been installed, as the general contractor (GC) intends to make the building watertight as quickly as possible. A typical day for a crew on the installation of a new roof would involve preparing the deck and then beginning to install the new assembly. Should the weather turn, crews can easily stop production and strive to make any exposed material and transitions watertight. Reroofing crews face greater challenges. To ensure the roof remains watertight through the construction period, they should only be removing as much material as can be reinstalled in a day, with temporary seals then made at transition points. Assuming the new vapour barrier has waterproofing properties, the project team may also decide to fully remove the existing assembly and use the new vapour barrier as a temporary water barrier while they remove the balance of the roof. 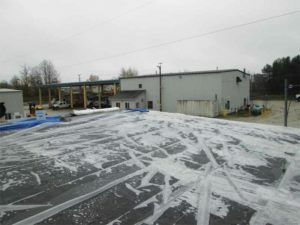 This approach has the bonus of increasing the amount of roofing material that can be removed in a day. It also helps minimize the clutter on the roof—since they are only replacing up to the vapour barrier, as opposed to the entire assembly, fewer materials are on the roof during the reroofing. Regardless, there may be prolonged periods of adverse winter weather putting greater strain on those temporary seals to keep the building watertight. Typically, these seals are not as durable as the completed roof and could expose the building interior to water damage through tearing. Additionally, when the deck is temporarily uninsulated, thermal comfort may have to be addressed, as will the increased risk of condensation on the underside of the deck in occupied conditioned buildings. Depending on the building requirements, this may require temporary tarping, heating, and ventilation. The complexity of the building design, ease of access to the roof, available space for materials and equipment, and the occupancy inside the building factor into the decision-making matrix. Further, the building’s HVAC system must be considered, particularly if units are being disconnected for a prolonged period of time to facilitate reroofing. This factor is discussed in more detail in the ‘Weather’ section later in this article.